One thing I love, is taking something old and making it different and better. I also love low-cost craft projects. So when the daycare I worked for was going out of business, there was a lot of stuff up for grabs. I snagged this shoe cubby that we used to hold the kids shoes, with the intention of updating it and using it for my own shoes. The first order of business was to clean it up, since obviously it had been well used over the years. I scraped the stickers off with a straight edge razor and cleaned the whole thing with a soap and water solution. I removed the shelves which made the cleaning process easier. The glue residue left a stain that I knew I’d have to cover. Next I spray painted the entire thing. I used white spray paint on the outside and a mint green spray paint on the shelves to add some interest. It has served me well for the past year and a half. It doesn’t have enough room to hold my boots and my boyfriends shoes are too large for the small cubby holes but for a project that cost under $10, I can’t complain. And because they’re always so fun, here’s a before and after for you! What awesome freebies have you updated with your own DIY touch? Let me know in the comments below. Fabric is a universal DIY and crafter tool. So I thought I’d share some of my favorite fabric stores online or near the U-District. 1. Pacific Fabrics. I mentioned Pacific Fabrics last week. This store is pretty well-rounded and does have a small selection of craft products as well. They also have a side store that has wedding and special occasion fabric. My favorite part of Pacific Fabrics is their interior design fabric on the big bolts. Even though this is usually pretty spendy, they have a great, really trendy selection. Pacific Fabrics is about a 25-minute bus ride from the U-District. 2. JoAnn Fabrics. JoAnn’s is a much more well-rounded craft store. They have a wide variety of fabrics and craft materials. The best part of JoAnn’s is their coupons. If you sign up for their mailing list, just about every week you can buy something for 40 percent off. The closest JoAnn’s to the U-District is in Ballard, about a 40-minute bus ride away. 3. IKEA. IKEA has a great fabric section with modern style fabrics that could easily be turned into throw pillows or curtains. The one thing IKEA really lacks is a staff. The fabric section is cut-it-yourself. So while at most stores you can go to the cutting counter and ask the staff questions or advise about your fabric, you’re on your own at IKEA. That being said, they have a great selection and you can almost always find bolts on clearance. IKEA is over an hour away by bus. 4. Etsy. Etsy is a fantastic resource for fabric online. 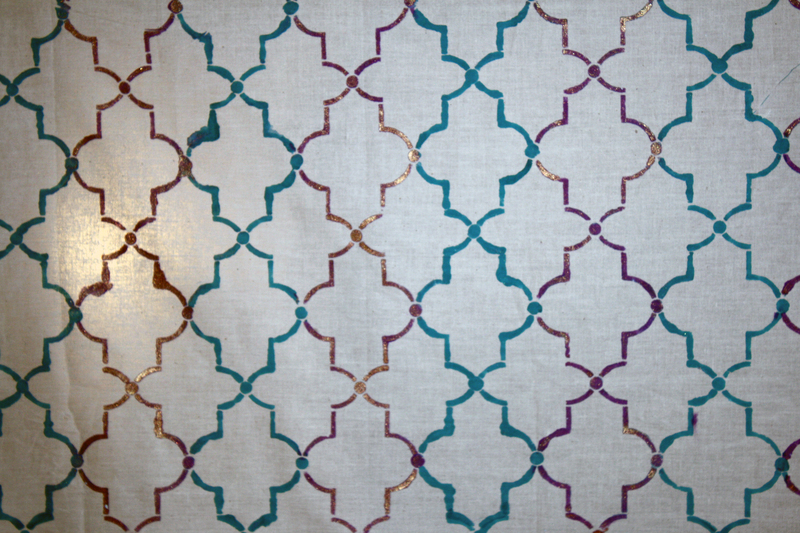 I purchased four yards of this fabric from an Etsy vendor to use in my living room. 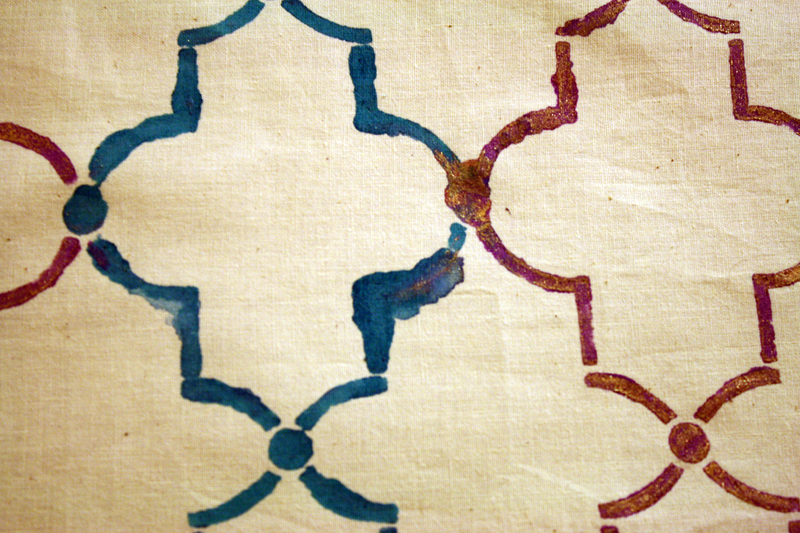 Etsy also has hand painted and dyed fabrics available if you’re not willing to try it yourself. (Check out my attempt here.) Prices vary widely on Etsy so make sure you shop around. Where is your favorite place to buy fabric? Are there any great fabric stores in Seattle that I’m missing out on? Let me know in the comment section. Because I am on a budget I decided to use a stencil, fabric, and spray adhesive that I already had. I also took Chris’s advice and used cosmetic sponges instead of a paint brush. 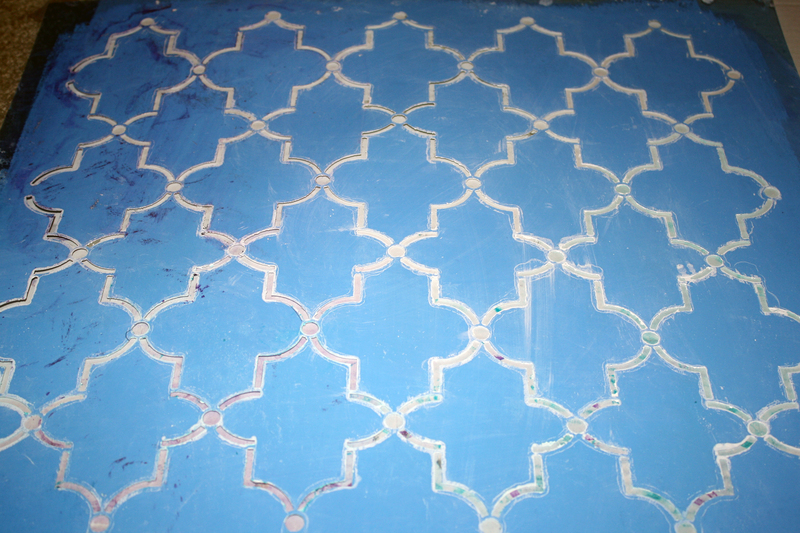 The stencil I used is this Moroccan pattern that I purchased at Hobby Lobby this summer for another project. Unfortunately Seattle doesn’t have a Hobby Lobby but you can buy it online here. I went to Artist & Craftsman, a craft store in the U-district to buy the fabric paint. They had a pretty good selection and I settled on these two colors. 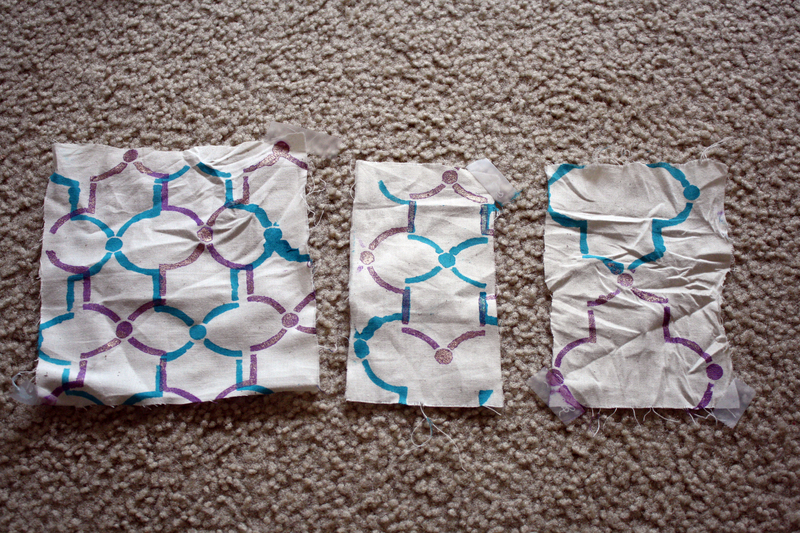 I then tested out different pattern ideas on some scraps of my fabric before I settled on the simplest design (on the right). 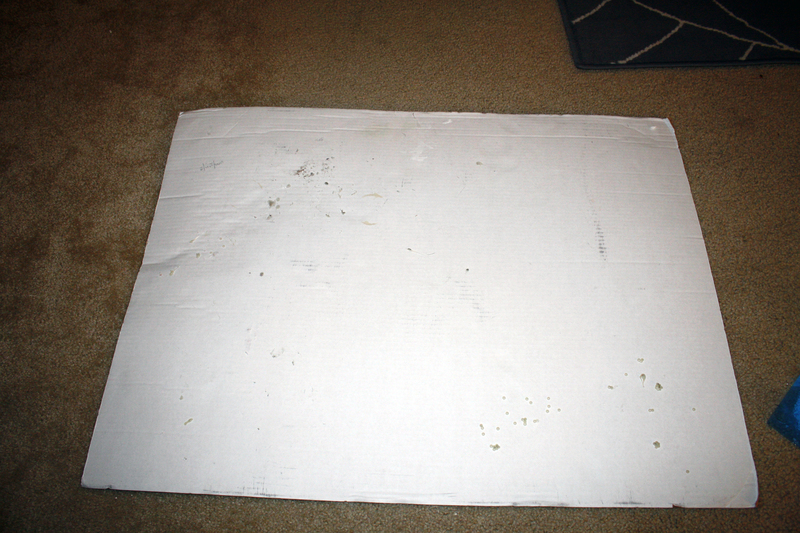 This big ugly piece of cardboard is probably one of my best DIY tricks. Because I live in an apartment and have no access to outdoor areas to paint, it’s really useful to have a big surface to paint on. 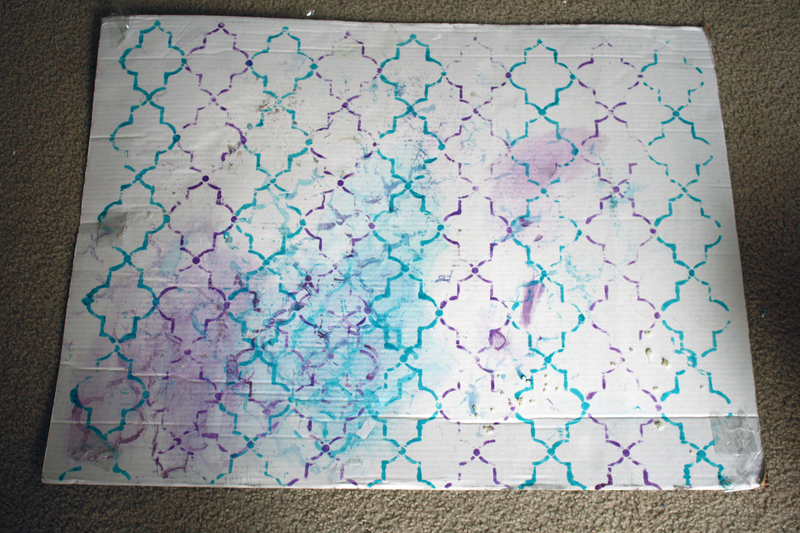 That way, when you’re fabric inevitably bleeds, it’s your cardboard and not your fabric that looks like this. Two things were really key with this project. 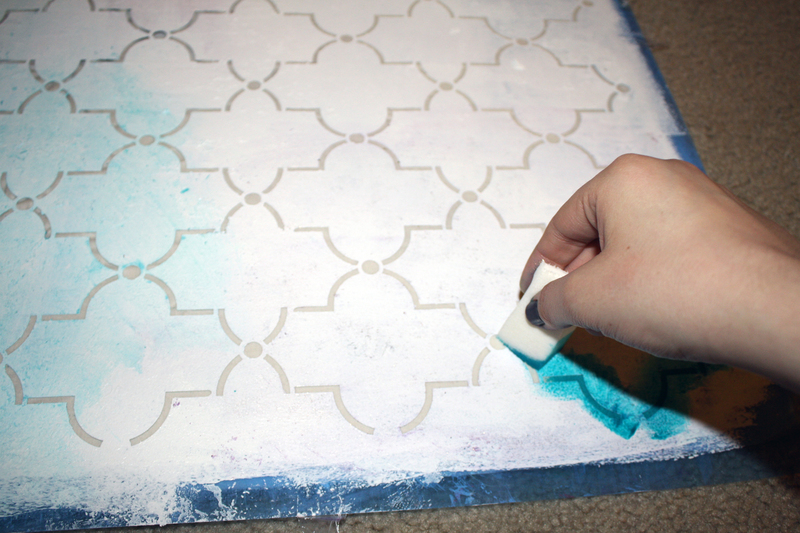 The first was using a spray adhesive to keep your stencil in place. You can really tell where I was diligent with it and where I wasn’t. The second thing was using the cosmetic sponge. They were super inexpensive and allowed you to dab on the paint without having too much excess. Once I finished, I left the fabric to dry for 24-hours. Then it was time to iron the fabric to set the dye. But overall, I’m really happy with how it turned out. As far as budget, I spent $10 on the fabric paint and $3 on the sponges but I hardly made a dent in either of them. I have big plans for this fabric. Tune in next week to see what I do with it. 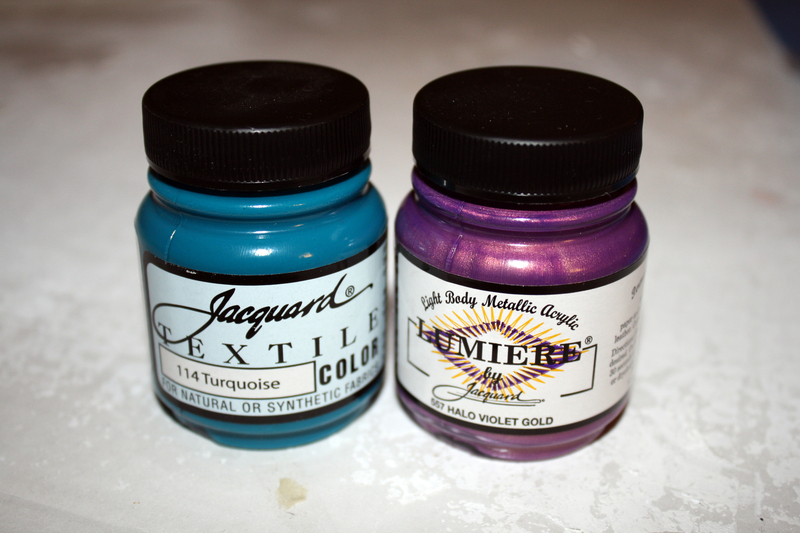 Have you painted fabric? How did it turn out? Let me know in the comments below. I have thought about and put off creating a DIY blog for the longest time. Growing up, a lot of the furniture in my house was made by my dad and my parents did a lot of home repairs themselves. I must have inherited that gene too, because I love creating things by hand for my house. I think I was the only 13-year-old who had an entire design inspiration folder when it came time to remodel my childhood bedroom (and strip it of its fantastic ’70s floral wallpaper). Since moving to the rainy city of Seattle to attend college at the University of Washington, I have lived in both a house and an apartment. And while I wanted to decorate and make those places feel like home, I was working on a college budget with renter’s restrictions. But I am constantly searching for bargains and coming up with ways to make things mine, without changing too much in my rented home. So hopefully, I can share some tips and tricks that students in the U-District and all DIY-lovers can put to use.